Currently (as of the beginning of October, 2017), there are two base modes of gameplay: Free Play and Passengers. After choosing your base mode, you can select your environment mode, which are Clear and Modern Apartment. Free Play is your standard sandbox mode where you can do whatever you want. 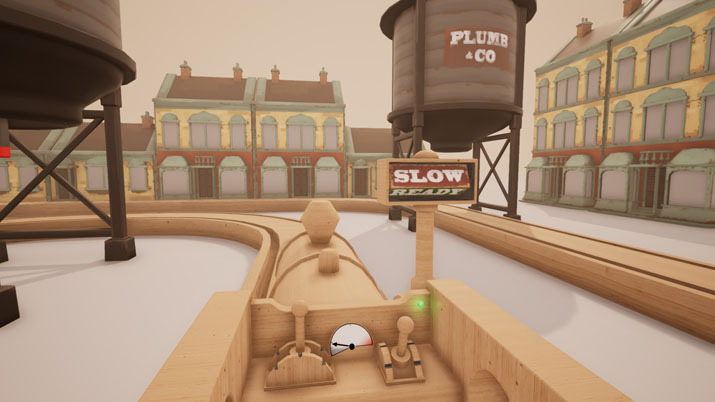 If you want to build the fastest train ride with boosts, corkscrews, and a roller coaster-type feel, you can. If you want to build a complex village with multiple stations, types of passengers, decorations, and routes, you can do that, too. If you want to add a huge tower of blocks all over the track line to crash through, Tracks has that available, too. Your only restrictions are your imagination and the available pieces — and Whoop Group is great at adding additional pieces and options with their regular updates. “Passengers” is your standard challenge mode filled with objectives that progressively get harder. Rather than designing whatever you want, you are given passengers throughout the room that you need to deliver to different stations. Your normal objectives are simpler, although sometimes you are told where the passengers are and other times you’re told to go find the passengers. Sometimes your objectives are more challenging, and you have a timer to beat as you place train tracks to deliver the passengers to a specific station. This can get complicated because if you make mistakes (or accidentally run your train off the track and kill passengers), you are probably going to fail the objective. However, failing isn’t an end of the world scenario: you’re just given a new normal objective, and you keep building. The Clear environment is a basic, empty room. There is no furniture to get in your way, and you have the space to do whatever you want. In contrast, Modern Apartment mode provides furniture to build around or to incorporate into your designs. The furniture isn’t anything fancy, but it has all the basics you’d find in an apartment living room and dining room space — couches, tables, chairs, etc. So far, Whoop Group has been great at updating and providing regular patches. They’ve solved numerous problems and added new pieces since the official early release on September 28, 2017. As it’s an Early Access title, it’s expected that there will be more updates, changes, and additions. Personally, I hope they add new environment layouts and roller coaster-like track pieces. The corkscrew is great, but it gave me a taste of crazy and now I want loop-de-loops. Whoop Group is also monitoring the forums and incorporating suggestions into their patches. This has created a pattern that gives hope to Tracks. Although not all Early Access titles are successful or finished, Tracks’ history of updates and patches show that it is off to a good start. However, even if Whoop Group decides to stop developing Tracks, the title is already fun and enjoyable to play. Controls aren’t always intuitive, but a menu helps with that. Right now, the controls aren’t always intuitive. Sure, Tracks has a great system of placing tracks and continuing to place them with your direction. You don’t have to try to line up each new piece, but trying to stop where you’re building and building somewhere else on your track line is difficult. Often, it helps to go to the menu where you can pick special pieces, place something, and then return to building your track. There is a track piece that you can select, which is helpful for building offshoots to your track line, but sometimes it’s still difficult to place. However, if you can’t remember how to work the controls or get to a specific menu, there is a list of controls that you can access by pressing ESC. I used this several times as I would forget a control and need to figure it out again. In contrast, driving your train in Train mode uses your basic WASD keys to steer and the spacebar to stop. Driving is simple and intuitive. You can drive and shuttle your passengers around, picking them up and dropping them off at various stations. Although if you make your track too complicated, you may forget where you’re supposed to turn to reach obscure passengers that need to go to work in a short timeline. But this is also part of the fun, so make that track as crazy and wild as possible: your passengers and driving ability might like it! When you drive your train, you can go pretty fast, especially if you use boosters. If you get motion sick easily in the car or on real-life roller coasters, you may want to consider not using boosters and not driving your train at full speed, especially if you have a lot of inclines, declines, and turns. As a person who can get motion sick easily myself (although it doesn’t deter me from riding the craziest roller coasters I can find), sometimes I had to take breaks after going especially fast in my weirder track lines. I figured out how not to drive so fast on the tight, multiple corners that sent my stomach tumbling. But, as I like building trains, I always returned quickly and started building again. 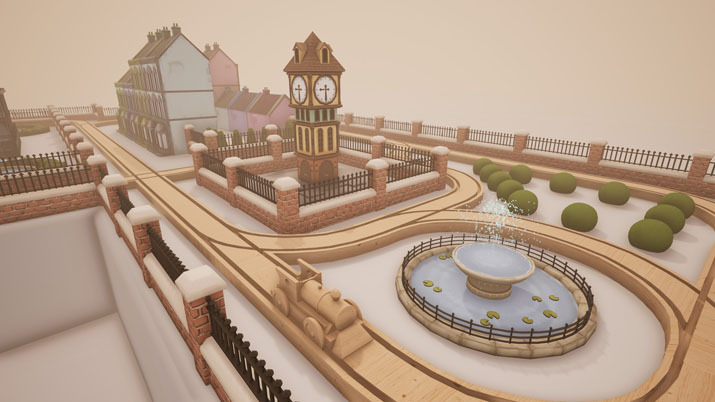 If you like building simulations and building wooden trains, Tracks is definitely worth trying now. The simulations of wood track trains are near perfect: they remind me of the wooden ones I played with as a kid. However, I’m hoping they add my definition and curves to the trees, as those aren’t a perfect duplicate yet. And even though Tracks is still in the early stages of Early Access, there are a lot of fun options for building your tracks and the city around it. It’s full of simple thrills: building whatever you can imagine, driving your train, and completing challenges. Tracks has been well-planned and has an exciting future of more regular updates and patches. Besides, someone has to help the wedding guests get to their wedding platform and station, although you decide if they need to blast through a tower of blocks to get there.